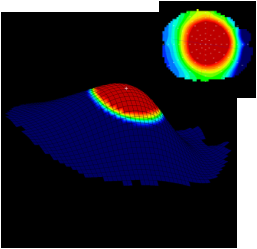 Keratoconus is a degenerative condition of the cornea that causes it to thin and become misshapen forming a cone like shape (see image above), hence the name. Keratoconus is part of a group of conditions called ectasias and is by far the most common form. It is generally diagnosed in the early to late teens and can progress until roughly 30 years of age. The presenting symptoms are blurred vision that cannot be effectively corrected with spectacles. Contact lenses are the mainstay of treatment as they offer much improved levels of vision when compared to anything else. These lenses are often bespoke, specially made, and more often than not are of the rigid variety. Although there is no cure for Keratoconus, recent innovations have mean't that it is possibly to curb the progression of the disease with a procedure called collagen cross linking. This is where UV light and a vitamin known as Riboflavin are used to harden the corneal tissue thus preventing the warp in shape and protecting the vision. In worse case scenario's a corneal graft procedure is needed to improve the vision, however, this is becoming less and less of a necessity with the advent of collagen cross linking and newer designs of contact lenses. For more detailed information on this and other corneal conditions please visit our sister site "Keratoconus Lens Fitting" by clicking the image opposite.